I still live at the Hotel du Quai Voltaire, but am for the nonce visiting friends at thise this rich hostelry. Last week Miss Lewis4 and I had an excellent dinner, with a good champagne, at Lapérouse for a hundred francs. I liked the place itself almost as well as the food, and it is not extravagant in price as Paris2 restaurants go now. At small hotels, like the Voltaire and the Hotel des Saintes Peres, one can still dine excellently, though somewhat slenderly, for ten francs. I am not going to shop any more than I have to, however. Everything in shops is costly, and the great change is that now all the less expensive things look cheap and shabby, as cheap things used to look in London5. You can still get a beautiful hat for 500 francs, but a 150 franc hat looks like 14th street in New York6. Silk gloves at 18 francs come to pieces the first time you put them on. PARIS still go there for dinner when neither of us is dining with friends. Miss Lewis goes on to Italy7 next week. The Hambourgs8 arrive on Saturday. I shall be here with them for several weeks, then go for a trip about the south of France9 with them. We will all meet at Sorrento10 about the end of July11. Then I hope to fall to work in a lemon house in the garden of my friends12 there. The garden runs down into the sea—or the bathing beach which terminates it does. I have not planned any new paragraphs for Claude13 yet, as a result of being here,—but I have planned to cut out several that otherwise would have gone in—so I feel I've not spent my francs in vain, especially those I have seen disappear in liquids suddy and golden, lively and still, thin and sharp, and thick and yellow as machine oil. The fruit and street flowers are not to be despised at this season. But the wines of France are really the supreme expression of its moods. I wish you were here. I could tell you a great many things that would sound absurd on either Bank14 or Park15 streets! Document is two leaves, handwritten on recto only of each leaf. Translation: Street of the Cat Who Fishes (French). 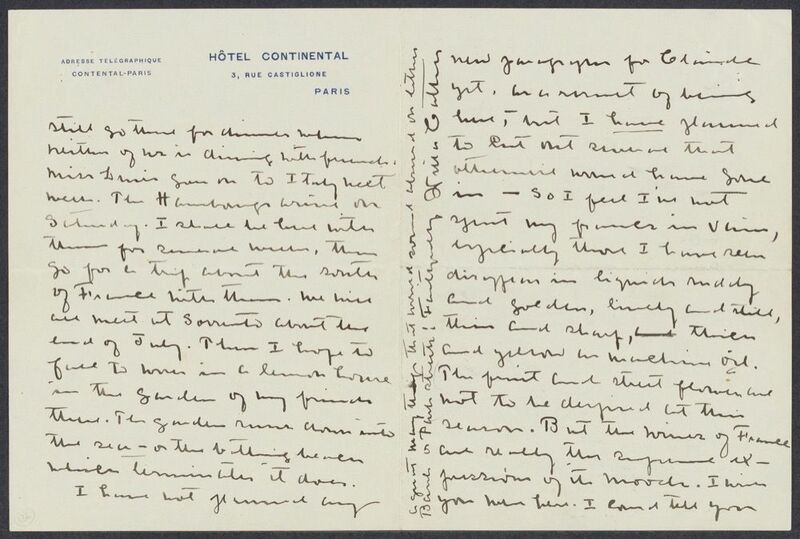 Cather did not complete this part of her trip because Edith Lewis, who went ahead of her to visit Earl Brewster and Achsah Barlow-Brewster, reported severe food shortages in Italy (see #0513). 5 Bank Street (New York City): The apartment Cather shared with Edith Lewis beginning in 1912, located in Greenwich Village in the Manhattan borough of New York City. Subway construction forced Cather and Lewis to relocate in 1927. Houghton Mifflin's offices in Boston were located on Park Street. Greenslet, Ferris (1875-1959). American editor and writer. Born in Glens Falls, NY, Ferris Greenslet earned a B.A. (1897) from Wesleyan University and a Ph.D. (1900) from Columbia University. He served as associate editor at the Atlantic Monthly from 1902 to 1907, and married Ella Stoothoff Hulst in 1903; they had two children, Marguerite (born 1904) and George (born 1906). As an author he specialized in biography. He became literary editor at Houghton Mifflin, the Boston publisher of the Atlantic, c. 1908 and was socially and professionally acquainted with Annie Adams Fields and Sarah Orne Jewett, who may have introduced him to Cather. 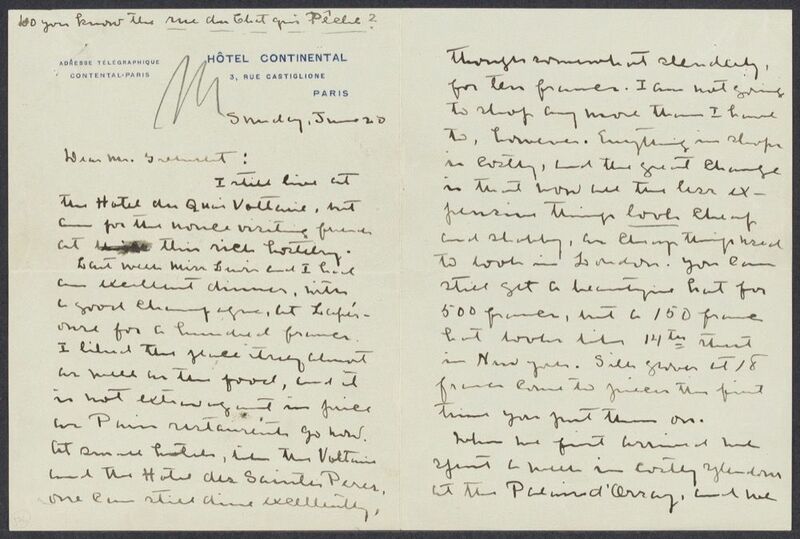 He evidently solicited Cather to submit Alexander’s Bridge (1912), her first published novel, to Houghton Mifflin. In 1910, when Greenslet became editor in chief of the trade department, Roger Scaife divided his shares as a director of the company with him, and the two presented themselves to authors as partners, with Scaife handling book advertising and format and Greenslet negotiating contracts and supervising editing; when Greenslet was absent from the office, Scaife handled correspondence with Cather. 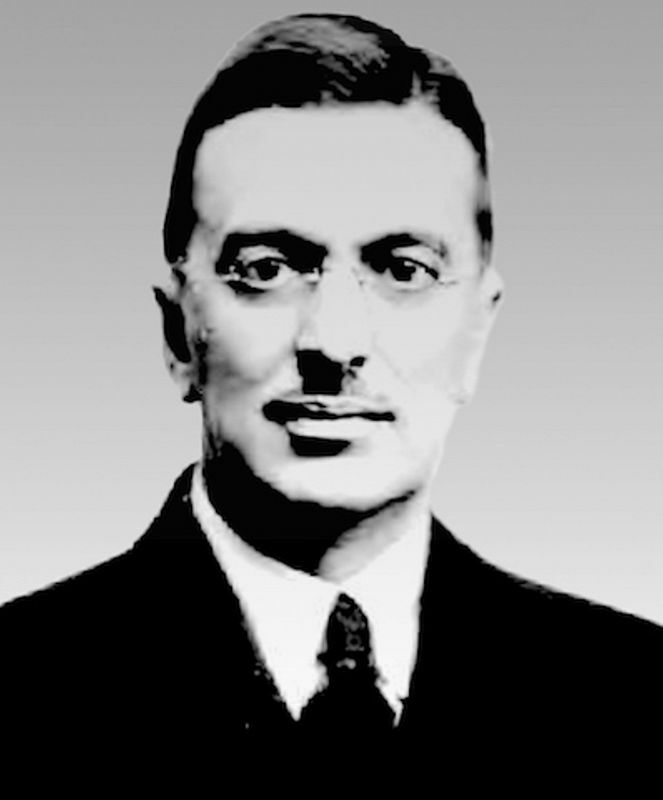 Greenslet became a director of Houghton Mifflin in 1919 and manager of the trade department in 1933. 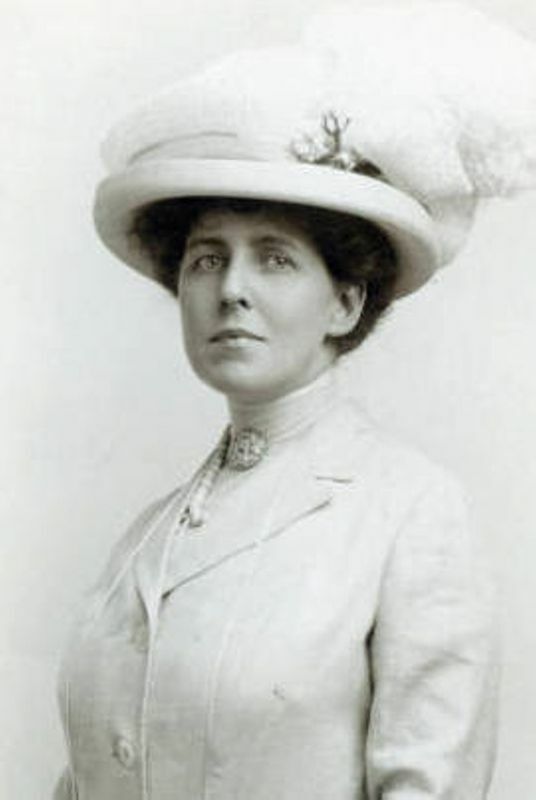 Cather left Houghton Mifflin as a publisher for Alfred A. Knopf, Inc., because she became dissatisfied with the production and advertising of her books. However, she remained on cordial terms with Greenslet and undertook several projects for him after her departure. Her extant letters to him constitute one of the largest groups to a single correspondent. Barlow-Brewster, Achsah (1878-1945). Expatriate American painter. Born in New Haven, CT, Achsah Brewster graduated in 1902 from Smith College, where Edith Lewis had become her roommate in 1899, inaugurating a long friendship. After college, Achsah moved to New York City to study painting at the Art Students League and the New York School of Art, where fellow student (and later poet) Vachel Lindsay introduced her to Earl Brewster. She may have met Willa Cather as early as 1904, when Cather, visiting New York from Pittsburgh, stayed with Edith Lewis on Washington Square. In 1910, she and Earl Brewster married and moved to Europe, returning to the U.S. only once, in 1923. From 1910 through 1935, they lived in various locations in France (where their daughter Harwood was born in 1912) and in Italy (where they met D. H. Lawrence and his wife Frieda in 1921), while also traveling widely in Europe and to Ceylon (Sri Lanka) and India. Edith Lewis visited Achsah and Earl in Ravello, Italy, in 1914 and 1920 and in Cyr-sur-Mer, France, in 1930 (with Cather) and 1935. 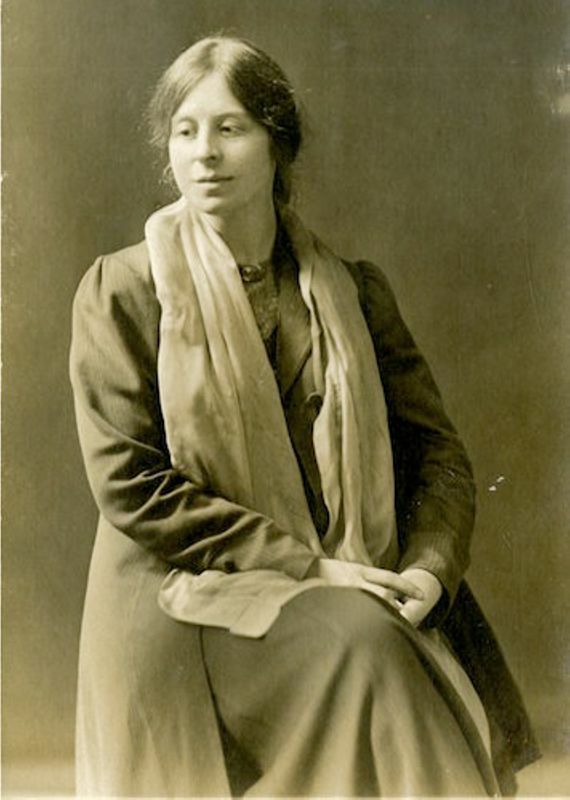 During her long trip to France in 1923, Cather introduced Achsah and Earl to Isabelle McClung Hambourg and Jan Hambourg. In 1935, Achsah and Earl moved to the Himalayan region of India, where she died ten years later after a long illness. Brewster, Earl (1878-1957). Expatriate American painter. Born in Chagrin Falls, OH, Earl Brewster attended the Cleveland Institute of Art for a year before moving to New York City in 1899 to study at the Art Students League and the New York School of Art, where he met fellow art student Achsah Barlow, whom he married in 1910. They immediately moved to Europe, returning to the U.S. only once, in 1923. From 1910 through 1935, Earl and Achsah lived in France (where their daughter Harwood was born in 1912) and Italy (where they met D. H. Lawrence in 1921), while traveling widely in Europe and to Ceylon (Sri Lanka) and India. Edith Lewis visited Achsah and Earl in Ravello, Italy, in 1914 and 1920 and in Cyr-sur-Mer, France, in 1930 (with Cather) and 1935. 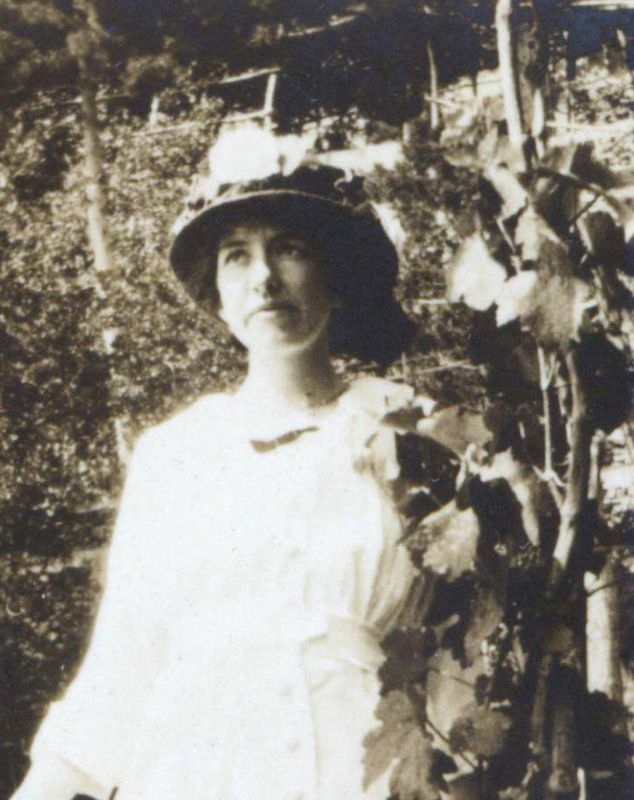 During her long trip to France in 1923, Cather introduced Achsah and Earl to Isabelle McClung Hambourg and Jan Hambourg. Earl had begun studying eastern religions early in his life, including the Vedanta school of Hindu religious philosophy, and he incorporated Buddhist iconography into his paintings. In 1935, the Brewsters moved to the Himalayan region of India, where he died more than two decades later.